Self- and audience-assessment on the fly is important for the best facilitations. Being able to engage with enthusiasm leads the invitation for stakeholders’ peak performance as a team. Active listening with poignant and probative questions are key components to successful issue resolution plans. I strive to meet those needs. Results speak for themselves. 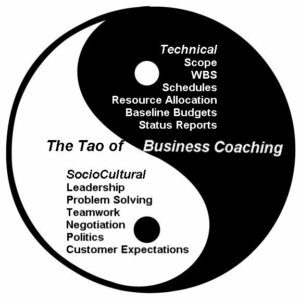 The business coaching model is quite effective, both perspectives as equal. According to one of the standard texts for facilitators, there are four basic facilitation styles. Directive: When the facilitator is providing instruction and information. Exploratory: When the facilitator is asking questions to explore experience and ideas. Delegating: When the facilitator is assigning tasks, roles, functions to group members. Participative: When the facilitator is participating in and guiding group discussion, sharing experiences with the group and encouraging group members to do likewise. This seems to be a rather simplistic, activity-based, approach to facilitation styles. Based on the descriptions, it seems possible for the facilitator to use all four styles in the course of a single meeting or event. Each of these aspects have their place and are included in our sessions. The most important is participative and the majority of the session is focused there. Our end of session facilitator surveys indicate our methods are productive, with rankings averaging 3.7+ out of a possible 4.0. Even with some sessions revealing both challenging and sensitive issues, the overall team strength rankings are at 3.8. For those familiar with DISC your facilitator’s Natural Style is Promoting Persuader; Adaptive is Developer. Myers Briggs profile is an ENTJ. Persuaders are able to impress others and sell themselves using their winning ways.Persuaders prefer their environment to provide mobility and they like challenging assignments and a variety of activities. They like to look good. Their positive outlook may cause them to be too optimistic about their work habits and other’s potential. They tend to overestimate their ability to change the behavior of others. Developers are persistent, and will jump whatever hurdles necessary to overcome obstacles to success. They have high expectations of themselves and others, and tend to be critical when standards are not met. With their intense focus on results, they may seem impatient and uncaring when dealing with others. The ENTJ (Myers-Briggs) has many gifts which make it possible for them to have a great deal of personal power, if they don’t forget to remain balanced in their lives. They are assertive, innovative, long-range thinkers with an excellent ability to translate theories and possibilities into solid plans of action. They are usually tremendously forceful personalities, and have the tools to accomplish whatever goals they set out to accomplish. Most recent participation in MIT’s 2015 & 2016 online programs through EdX and U.Lab includes coursework in Transforming Business, Society and Self with additional work in Leading from the Emerging Future. Programs incorporate leading-edge facilitation practices for collaborative engagement in program and project management.